A social profiles widgetized zone with custom widgets to display your Twitter, Facebook, Vimeo, Flickr, etc, profiles in the sidebar. 7 Smashing MyStream-specific widgets, including the new Tabber widget, which allows you to move that stunning tabber anywhere in the sidebar. Flexible 3 column layout with a variety of different widgetized spaces & layouts. 6 delicious colour schemes to choose from! The theme offers short blog excerpts and links to 4 social media profiles in an about area. It also offers a stander aggregated Lifestream list but also supplements that with a widgetized photos & videos area in the sidebar. 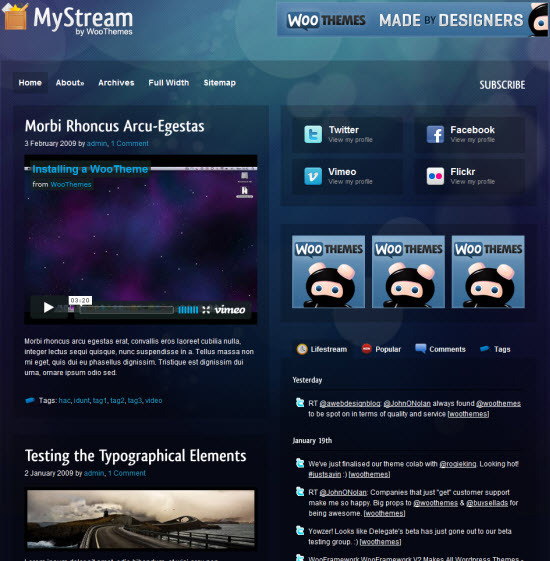 The theme costs $70 and you can get more details on it here and see a demo of the theme here. Note there are many Lifestreaming themes available for WordPress and I’ve provided a list of all of them here. Very nice looking theme, but $70?? Yowzers! Same functions you become with agregado theme (http://licious.ch/agregado) of Darren Hoyt. 70$ is too much. I'm with you on this one Claudio. But I like to provide news on all Lifestreaming themes.